These no-bake Chocolate Hazelnut Brownies taste delicious and are great as a healthy sweet treat or dessert. I made them for the first time during our Mindfulness Retreat in Friesland last weekend. I wanted to create a healthy, (refined) sugar-free dessert for our retreat guests. I found this recipe for Raw Hazelnut Chai Brownies on Green Kitchen Stories and I decided to tweak the recipe a little and give my own twist to these easy-to-make brownies. 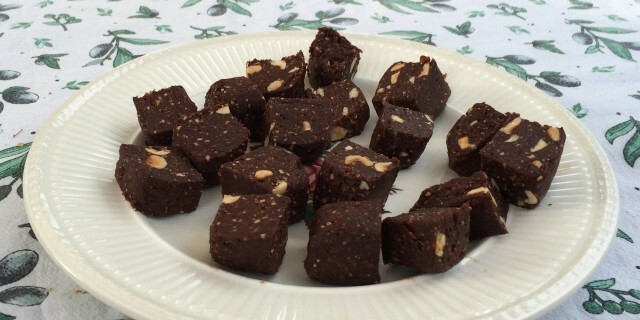 By adding ground hazelnuts to the recipe and more cacao powder they become more firm in texture, almost like a fudge, and have a stronger chocolate flavour. I love hazelnuts but I especially love them roasted as it brings out their sweet nutty flavour. The combination of raw cacao with vanilla powder and roasted hazelnuts give the fudgy Chai Brownies a delicious Nutella flavour. I used to love the taste of Nutella growing up as kid but store-bought Nutella with its high sugar content, refined and artificial ingredients is just about as healthy as a candy bar. While the sugar in store-bought Nutella will race directly into your bloodstream, the fat, protein and soluble fiber content in these Chocolate Hazelnut Brownies will help slow down the release of the natural sugars from the dates. So these brownies do not only taste amazing; they are pretty healthy too for a sweet treat or dessert. I love these little fudge pieces of brownie and cannot get enough of them. Our retreat guests loved them too so I had to share my recipe with you! Place all ingredients, except for the chopped hazelnuts, in a strong food processor. Use a spoon to mix the ingredients well and form into a sticky dough. Then, remove the dough from your food processor and place in a large bowl. Continue to kneed it by hand. Add the chopped hazelnuts and knead them into the dough. If the dough sticks to your hands or to the bowl, add a little more cacao powder, ground hazelnuts and/or flax seeds. The mixture should be firm and ‘dry’. Cover a baking tray or wooden chopping board with baking paper and place the dough on top. Use your hands to create an even layer of the dough, about 1,5 cm high. Cover with baking paper and let it sit in the fridge for about half an hour. Remove from the fridge and, when still cool, cut the dough into small cubes with a large sharp knife, like pieces of fudge. Bring up to room temperature before serving.